Join us for a keynote address and panel discussion on how the Black Lives Matter movement has been covered in national, regional and local media. 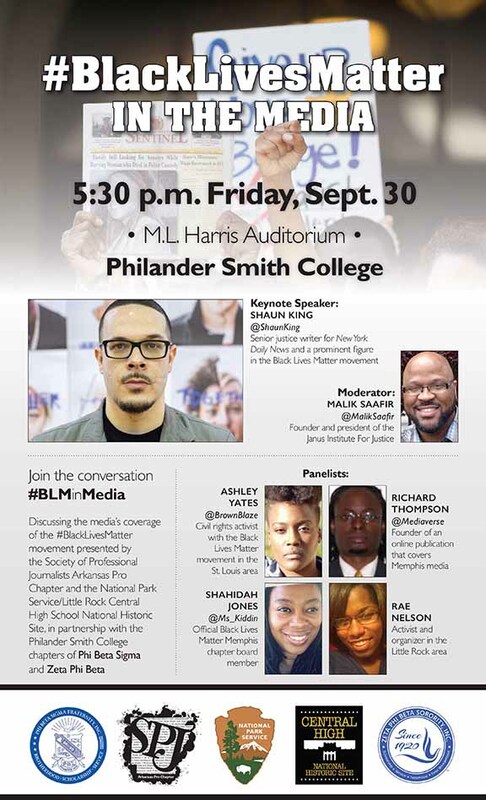 Keynote speaker Shaun King is a senior justice writer for New York Daily News and a prominent figure in the Black Lives Matter movement. King has written extensively about the movement, covering discrimination, police brutality, the prison industrial complex and social justice in the wake of violence in New York, Baltimore, Cleveland, Ferguson, Missouri, Charleston, South Carolina and other cities. The event is free and open to the public. It is sponsored by the Society of Professional Journalists Arkansas Pro Chapter and the National Park Service/Little Rock Central High School National Historic Site in partnership with the Philander Smith College chapters of Phi Beta Sigma and Zeta Phi Beta. LIVE STREAMING: We will live stream the event on the Arkansas SPJ Facebook Page.